This morning as soon as Animal Control opened, I called to see if they had any black cats. "Oh sure, we have a ton of black cats!" 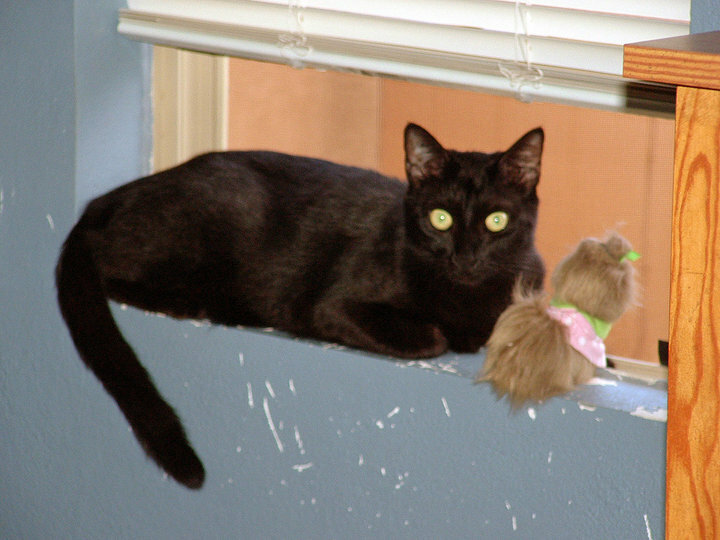 Esther on the window ledge. The paint is "nicely" scratched off by her and our other kitty we used to have. I found out the fees for retrieving our kitty if she was there, and Daddy said I should head out quickly since there is an additional charge for each day your cat is there. So before anyone even got to eat, I headed out with Cherished of God, whose turn it was to go with me (I rotate taking each child with me on errands to spend one-on-one time with them). We maneuvered through the roads because of the detour by our house and finally arrived at the pound. All of the children were so hopeful that she would be there. I was as well and thought we would soon be returning home with Esther. The man at the front desk informed us we would have to go up the stairs at the back of the building to see if our kitty was indeed there. We made our way past barking dogs...and more barking dogs to the cat area. We looked in all the cages to see if our Esther was there. Cherished of God excitedly went up to a black kitty and said, "Oh hi, Esther!" Indeed, the kitty did look a lot like Esther, but this one was smaller as it was only 6 months old. The only other all-black cat was a big fluffy one, nothing like Esther. As the realization that our kitty was not at the pound after all set in, Cherished began to cry. Oh dear, oh dear, I'm sorry honey. We went back to the front desk to fill out a Lost Cat report, but I don't know what good it will do since they said they will not call us. Now I have made some fliers like Daddy suggested, and soon we will go post them around our neighborhood (and hope we don't get any weird phone calls). Husband suspects Esther is dead, as he has seen coyotes around our neighborhood before. O' I am so sorry to hear about dear Esther. I too have a pure black cat, and her name is Ruby. I do hope the sweet Esther is just hiding and hope she comes home soon. Oh no!! We lost a very special cat last year, and I know how hard it is... I hope you will found Esther safe very soon!